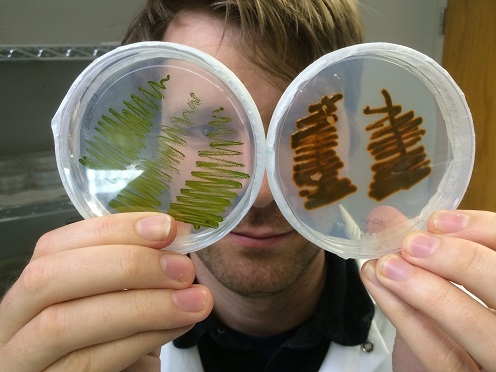 Green Future: The intriguing possibilities of marine algae as future food and ingredient producer has been the focus of a series of radio programs featuring postdoc Johan Andersen-Ranberg form Center for Synthethic Biology, Plant Biochemistry Section, PLEN. What are we going to eat when the climate changes? asks P1 Digitalt in this edition of the show. Among the opportunities for future food, is the super-algae, explains Johan Andersen-Ranberg. The thriftly algae is ideal for sustainable farming since it can grow in salt water and can therefore alliviate some of the pressure on farming land. His own focus in on modifying the marine algae Nannochloropsis oceanica to produce food ingredients, vitamins and e.g. omega-3. UN has decided upon 17 goals for Sustainable Global Development by 2030. Among the goals to reach before 2030 is to end hunger, ensure food security, end malnutrition and ensure sustainable food production systems. The DR P1 program ‘P1 redder verden’ has focus on these goals. In the program, Johan Andersen-Ranberg contributes with his input on how algae can contribute to ensure higher quality food and better nutrition without the need for arable land. Not only can algae be part of better food security on Earth. The plant ancestor can also contribute to long-term space travel and off-planet settlement. Optimising algae for space food is in the far future - but already something scientists are focusing on now. Imagine an off-planet settlement that produces medicine in algae on their new planet. If they suddenly need to produce something new, e.g. diabetes medicine, the DNA-code can be sent via radio waves from Earth for easy printing and integration in their own algae.